Beautifully illustrates the intriguing discoveries of the Baron Lahonton. Carte du Canada Qui Comprend la Partie Septentrionale des Etats Unis D'Amerique. 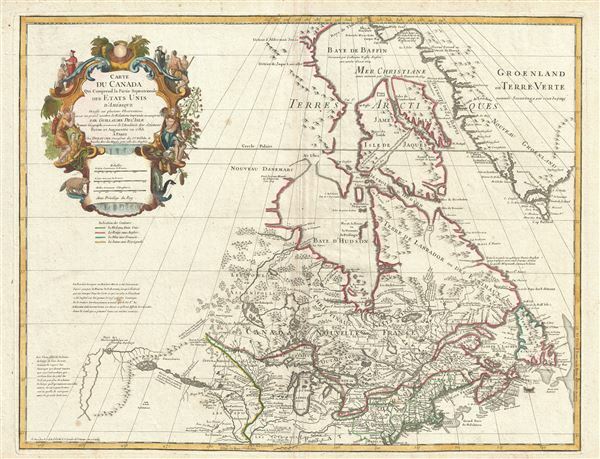 This is the 1783 Dezauche issue of Phillipe Buache and Guillaume D L'Isle's important map of northern North America. The map covers the United States north of the Chesapeake and Canada or New France. De L'Isle first issued this map in 1703. At the time it was the most sophisticated cartographic representation of this region yet published, referencing various elements from the most recent explorations including the Jesuit Relations, Pierre Le Moyne d'Ibervile, Pierre Le Sour, and Baron de Lahonton. At the close of the American Revolutionary War, in 1783, Dezauche, Buache and De L'isle's successor, redrew the classic 1703 map to represent the new borders between english, Spanish and United States territories established by Treated of Paris. Here the United States territory begins in the northwest at the sources of the Mississippi. The border then extends eastward through the Lake of the Woods to bisect Lake Superior, Huron, eire, and Ontario (leaving Michigan or, as here, 'Lac des Illinois,' fully in U.S. territory). eastward of the Great Lakes the border passes northwest along the St. Laurence before cutting east to divide Lake Champlain. It then follows the headlands to the Riviere Sainte-Croix which exits into the Atlantic. To the west the United States border is set along the Mississippi River. Lahonton n'ait invente toutes ces choses ce qu'il est difficule de resoudre dtant le Seul qui a penetre dans ces vastes contrees. As it may be, this map proved highly influential and was one of the best maps of this region until the explorations late 18th and early 19th century. A decorative title cartouche in the upper let quadrant features stylized New World fauna, including a beaver, and missionaries converting indigenous American Indians. This map was published in J. Dezauche's 1789 reissue of G. De L'Isle and P. Buache's Atlas Geographique et Universel. Very good. Original centerfold. Original pressmark visible. Blank on verso. Tooley, R. V., The Mapping of America, p. 20-1, #42. Kershaw, K. A., Early Printed Maps of Canada, 315. Karpinski, L. C., Bibliography of the Printed Maps of Michigan, 1804-1880, p. 40, 47.